The man-made glass with a metallic sparkle and the source of the word "aventurescence." 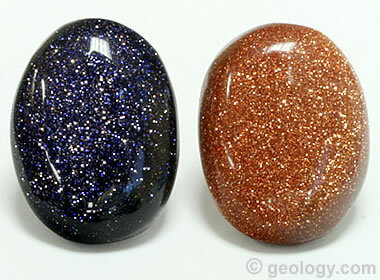 Goldstone Cabochons: The bright reflective sparkle of goldstone is what makes it a popular man-made gem material. These blue and reddish brown goldstone cabochons are about 20 x 28 millimeters in size. Goldstone is a man-made colored glass that contains abundant, flat-faced, highly reflective inclusions. The reflective inclusions have a bright metallic luster, and their glittering appearance immediately attracts attention. This exciting appearance has made goldstone a popular man-made gem and sculptural material. It is often cut into cabochons, hearts, beads, spheres, pendulums, arrowheads, and small sculptures. It is a popular material for making tumbled stones. 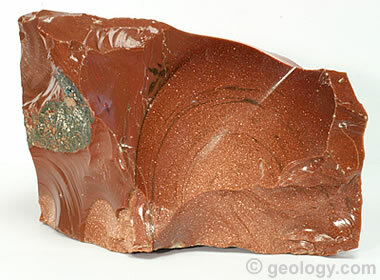 Goldstone is produced in a variety of colors. Reddish brown, the original color, is the least expensive and the most commonly encountered variety of goldstone. 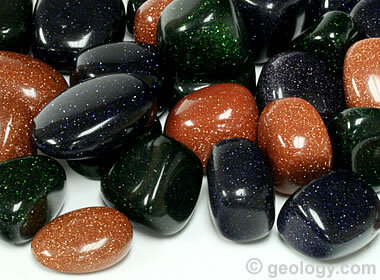 Dark green, dark blue, and dark purple goldstone are also produced. Tumbled Goldstone: Pieces of reddish brown, blue, and green goldstone that have been shaped and polished in a rock tumbler. These pieces are approximately 20 to 25 millimeters along their maximum dimension. 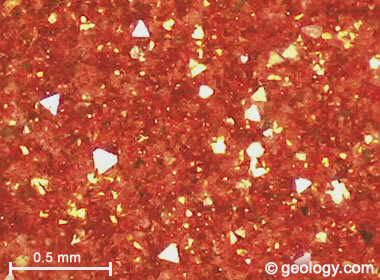 What Causes Goldstone’s Glittery Appearance and Color? The glittery appearance of goldstone is often attributed to “bits of copper” or “copper filings” that have been added to the glass. That simplistic description is incorrect. Reddish brown goldstone is made by heating molten glass to a temperature that is hot enough to dissolve granules of copper oxide that are added to the melt. After the copper oxide is completely dissolved, the melt is allowed to cool very slowly. This slow cooling gives copper ions in the melt adequate time find one another and grow into octahedral-shaped copper crystals. The slower the cooling, the larger the copper crystals. Copper Crystals in Goldstone: You are looking through a microscope at a polished surface of reddish brown goldstone. A bright light is shining down onto the surface of the goldstone. The triangular faces of octahedral copper crystals are reflecting the light back at you from various depths below the polished surface of the transparent glass. The largest triangular crystal face seen in this view is about 0.1 millimeters from apex to base. The bright metallic luster of these copper crystals is what produces the sparkling appearance of goldstone. An octahedral crystal has eight triangular faces. If you look at goldstone with a microscope under reflected light, you will see triangular faces of the copper crystals reflecting the light back at you from various depths below the surface of the glass. See the accompanying image. The glass of reddish brown goldstone is colorless. Its reddish brown appearance is caused by reflections from the included copper crystals. Blue, green, and purple goldstone are made using compounds of metals other than copper. The color of these goldstones is caused by the color of the glass rather than the color of the reflections from the metallic crystals. The glass color of blue goldstone is caused by cobalt, green is caused by chromium, and purple is caused by manganese. Reflections from the metallic crystals within the goldstone attract attention and give goldstone its sparkling appeal. The sparkling appearance of the reflections is intensified in three situations: 1) when the goldstone is moved under incident light; 2) when the light source is moved; and, 3) when the eye of the observer is moved. Before the name “goldstone” was used, the material was widely known as “aventurine glass.” That name is the source of three words that are commonly seen in gemology. “Aventurescence” is the name of a phenomena that is produced when a material has light-reflecting particles that produce a sparkly or glittery luster. “Aventurescent” is an adjective used for materials that exhibit the phenomena of aventurescence. Examples are aventurescent quartz, aventurescent feldspar and aventurescent iolite. 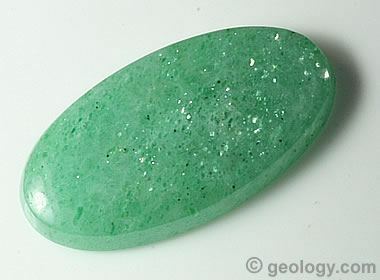 “Aventurine” is a noun used for a variety of green quartz that contains tiny highly reflective flakes of a green chromium-rich mica known as fuchsite. The reflective flakes of fuchsite produce the aventurescent luster and impart a green color to the material. The earliest known object made from a goldstone-like material is an amulet excavated in Iran and dated to be from the 12th to early 13th century. The beginning of modern aventurine glass production began in Murano, Italy during the 17th century. It has been produced there, with some interruptions, up to the present time. A few decades after manufacturing began in Italy, Chinese glassmakers were also producing items made from aventurescent glass. The Imperial Workshop was making aventurine glass bottles that were given as gifts and rewards by the Qing court. Today, much of the goldstone being sold as a gem and lapidary material is coming from factories in China. If you visit Ebay or Alibaba, you will see sellers disclosing that the goldstone offered for sale has been made in China. Goldstone Rough: This is a large chunk of goldstone rough that measures about 8 inches across. Some parts of this specimen would be suitable for use in lapidary projects. However, other areas are clearly not as desirable. On the left side, you can see some slag and areas without visible sparkle. This specimen is a good example of how the quality of goldstone can vary greatly even within the same batch. Click to enlarge image. 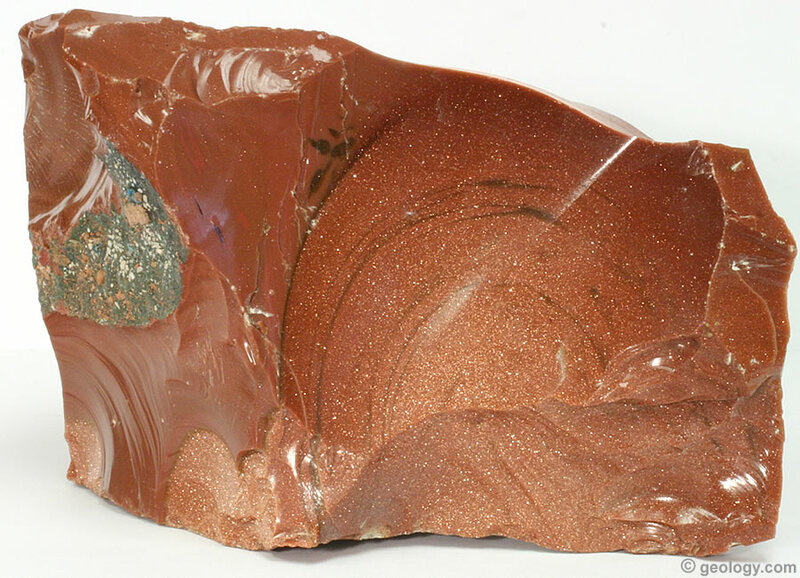 Rough goldstone is usually sold as broken chunks and as slabs suitable for cutting cabochons. The chunks range from small pieces used for rock tumbling to large pieces weighing over 50 pounds. Although goldstone is a man-made material, it varies greatly in quality, appearance, and suitability for use in making cabochons, tumbled stones and other objects. The buyer needs some knowledge of how goldstone is made to make an intelligent purchase. Goldstone is made in a large heated vessel that might produce 100 pounds of material or more. After it has been heated and held at the proper temperature, the glass is allowed to cool slowly. Slow cooling allows time for the reflective metallic crystals to grow to a large size. The batch cools fastest near the outside of the vessel. The smallest crystals in the batch are usually found near the wall of the vessel because that is where the rapid cooling occurs. There, the crystals can be too small to produce the desirable glittering effect that gives goldstone its appeal. The crystals usually grow progressively larger towards the center of the vessel, where cooling is slowest. Goldstone Amulet from 12th Century Iran, webpage on the Metropolitan Museum of Art website, accessed November 2017. Murano, Its Glass and Its People, article on the Delaware Valley Paperweight Collectors Association website, accessed November 2017. Snuff Bottle with Aventurine Stopper, webpage on the Metropolitan Museum of Art website, accessed November 2017. Within a batch, the glass can have areas with few visible crystals, areas with numerous gas bubbles, and areas of slag. All of these areas are unsuitable for use, and any buyer who is paying by the pound should make sure that the price paid does not include the weight of useless material. So, if you are buying rough goldstone, pay attention to crystal size, the presence of areas without crystals, the presence of gas bubbles, and areas of slag. Slag, bubbles, and areas lacking flash will be unusable as “goldstone.” Also, some goldstone only exhibits aventurescence from two directions instead of from all directions. It is best to buy goldstone where you can inspect the rough from all angles in directional light. The next best way is when you can see photos of the piece that you are going to buy from multiple directions with views that are close enough to see the flashing crystals. Buying chunks or lots of goldstone shown in a single photo or sight-unseen from an internet vendor is a risky spend of hard-earned money.